This is the best recipe there is. The Omas of all Maultaschen recipes. It isn’t too bready or too meaty. Check out the layers of flavor (butter and spinach, butter and herbs, eggs and ground meat) and the detailed description of making this recipe in my previous post. The dough is also a pleasure to sink your teeth into. My heartfelt thanks go to my former landlady who, as always – like when I locked myself out of our flat with two small kids, welcomed me into her home and into her kitchen and shared her family’s recipe. Place flour in a mixing bowl. In the middle, create a well. Add one whole egg. Add the egg yolk of the second egg and save the egg white and put aside. 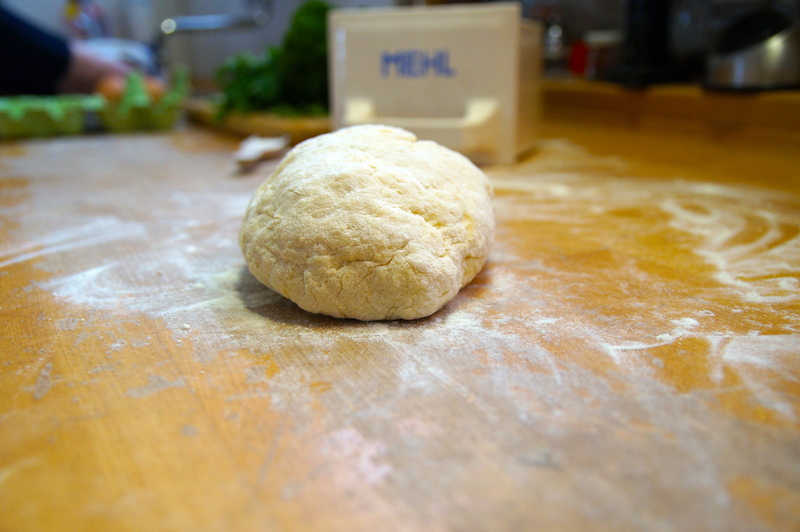 Add salt and oil plus a few tablespoons of water – enough water to create a smooth dough. Mix everything together and then knead the dough as quickly together to prevent any unsightly clumps. You’ll have one smooth mound of noodle dough once you are done. Place it back in the bowl and cover with a kitchen towel. Set aside in a warm spot for about 30 minutes. Slice the stale rolls and soak them in water. Set aside. Fill a large soup pot with water and put it on the stove top to bring to a boil. When you are done assembling the Maultaschen you will put them in this pot to cook. Saute half of the onion in half of the melted butter in a saucepan big enough to later accommodate the spinach too. When the onions are glassy, add the spinach. Saute for about 10 minutes on a medium heat till it’s warmed through and the butter and onions are blended together with the spinach. Set aside to cool. Melt the rest of the butter and add the remaining chopped onion. When soft and glassy, add the chopped parsley till still bright green but wilted. Set aside to cool. Return to your soaking bread and squeeze out all of the water. Set aside in a strainer to completely drain. Mix the ground meat and Braet together in a bowl and add the eggs, salt and pepper. Mix well. 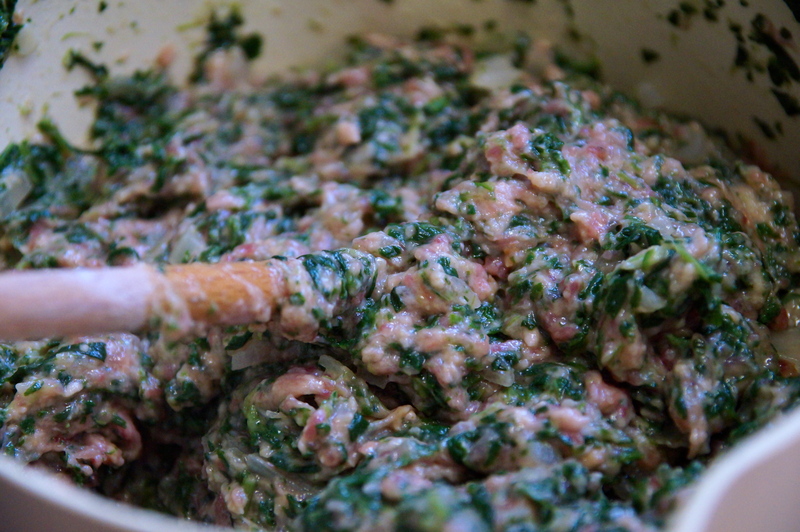 Add the bread crumbs, the spinach and parsley mixture, top with some grated nutmeg and mix well again. In case the mixture is too wet, add some dry bread crumbs. If it is too dry, add an egg. Now it’s time to reintroduce the dough. Cut into pieces which you will roll out. Flour the surface before rolling out. They say that it should be rolled so thinly that you can read a newspaper through it, but roll out to the thinness or thickness of your personal preference. Spread out the filling on the rolled out dough. Using a pastry brush, brush the edges of the dough with the egg white you set aside at the beginning. Start to gently roll the dough together and seal the edge shut. Using the handle of a wooden cooking spoon, smooth out your rolled giant stuffed noodle and then divide the Maultaschen into pieces. You can use a pasta wheel to cut off the pieces or else a regular kitchen knife. Add either bouillon powder or salt to your Maultaschen depending on what you want to cook them in. Once you have a good roaring boil back in your pot, cook your Maultaschen for ten minutes. Set aside and drain. At this point, you can spread these out on a baking sheet and place in the freezer. Like mandu, you can then place these in an airtight container after a couple of hours. To eat in a soup, have broth ready with some snipped chives or chopped parsley and serve the Maultaschen with the broth in a soup bowl. You can also just eat the Maultaschen with a fork and knife on a plate as is. Otherwise, you can slice the cooked Maultaschen and fry in melted butter and slice onions. It is also traditional to add a scrambled egg at the end. Frying the Mautaschen is a great way to prepare Maultaschen that is a day or two old. I hope you feel like you’ve recreated the Swabian kitchen when making these: the smell of beef broth, frying onions in butter. Maultaschen really is one of my fondest aspects of living in this corner of the world. Tags: cooking Korean in Germany, Jane, Maultaschen, Maultaschen recipe, Schwabenland, Swabian food. Bookmark the permalink. We were definitely lucky to have such great landlady. She was also extremely relaxed and open, characteristics that this region is not known for. We still ask her for tips and suggestions on the best vendors from butchers to builders! Thanks for coming by commenting! That’s sweet of her! It’s wonderful and refreshing to know such kind people, especially when you feel comfortable enough to ask them for advice.